Dynamic entertainer and two-time ASCAP Songwriter of the Year Phil Vassar is heading out on the fall leg of his 2015 #noPHILter tour. Vassar has an ambitious tour schedule with 30 dates remaining of the over 125 appearances in his 2015 tour schedule. Venues among the concert lineup stretch from Oregon to Maine to Florida and nearly everywhere in between. For a list of upcoming tour dates, see below. “I’m really looking forward to the fall leg of our 2015 tour", says Vassar. "We have never had so much fun as we have had this year with the crowd tweeting requests to #noPHILter. It keeps the shows real and interactive – we are like a live jukebox. The interaction with the crowd is amazing." Vassar’s incisive, soulful lyrics and infectious melodies capture the heart and soul of fans of all ages, all over the world. In fact, he has a strong social media fan base with followers spanning 45+ countries on 6 continents. His fans love his wildly energetic shows as they are a reflection of their social media requests during the show and his personal interaction with the crowd. That personal interaction ensures no two shows are ever alike. Vassar hails from Lynchburg, VA but has called Nashville home since his music scene debut in the late ‘90s. Since arriving in Nashville, he has had huge success as a singer, a songwriter, and an overall entertainer. His achievements include eight critically-acclaimed albums, ACM Top New Male Vocalist of the Year, Billboard Country Songwriter of the Year, and Daytime Emmy nominee for “Outstanding Original Song.” As a songwriter he has 26 Top 40 hits, 15 Top 10 hits, and 10 hits which have topped the charts at number one. Music fans will be excited to know that Phil is currently putting the finishing touches on his ninth studio album which has been five years in the making. 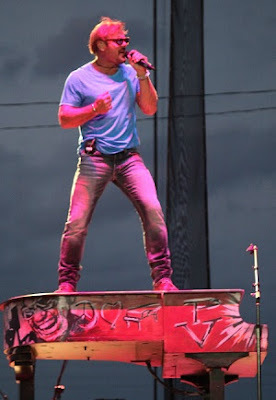 For more information, please visit www.PHILVASSAR.com.